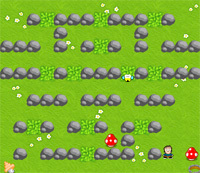 Help James bomb to destroy all the monsters of the labyrinth. Recover a maximum of bonus to pass the levels. Don't soot on the hole from exit before to have eliminated all the monsters.